Combine potatoes, onions, chives, mayo, salt, and pepper. Mix well. Fold in eggs. Refrigerate for several hours until chilled. Enjoy Your Day and Stay Safe! Hi Cozies...I own every one of Erma Bombeck's books. Her humorous wisdom is timeless. Thank you so much for sharing her take on July 4th. I'm wondering how many of you also enjoyed her writing (I don't think anyone got killed in her books!) and were influenced in some way by her. She was the best and I miss her. Thank you for the words from Erma. No one else is ever able to say it the way she did. YES! 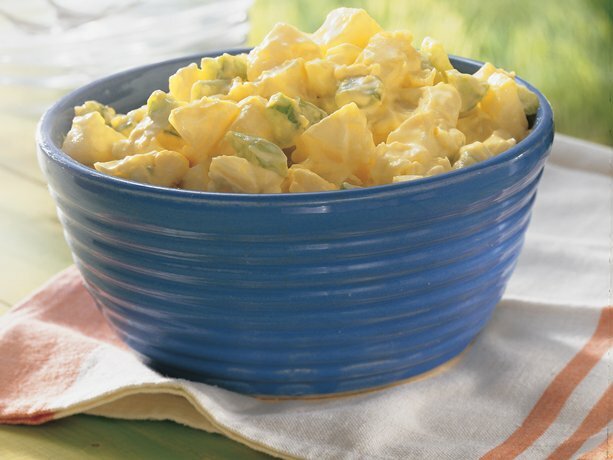 Finally, someone else who doesn't put mustard in there potato salad. Sounds like how my mom makes hers, but hers isn't yellow. I like it this way because it isn't sweet. Oh, she also uses 1/2 mayo and 1/2 Miracle Whip (low fat).